The big winner of the year was writer/director Anthony Minghella's The English Patient (a Saul Zaentz/Miramax film). [20th Century Fox studios dropped its support during pre-production, letting it go to the independent Miramax.] It was a prestigious, three hour long World War II saga/romance composed of flashbacks, conspiracies, and ambiguities and based on an adaptation of Michael Ondaatje's novel, about a French-Canadian nurse who cares for a mysterious, dying burn patient ('The English Patient') in a ruined, abandoned monastery in Italy's Tuscany, after he was wounded in a WWII plane crash in the African desert. Its tagline was: "In love, there are no boundaries." It had twelve nominations and nine Oscar wins - Best Picture, Best Director, Best Supporting Actress, Best Art Direction, Best Cinematography, Best Sound, Best Original Dramatic Score, Best Costume Design, and Best Film Editing. It lost its nominations for Best Adapted Screenplay (Minghella), Best Actor (Fiennes) and Best Actress (Scott Thomas). 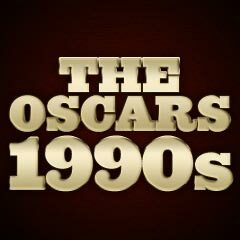 Its nine Oscar wins made it the third most-awarded film in Academy history - and tied it with two other films with nine wins: Gigi (1958), and The Last Emperor (1987). Previously, only two other films had more wins: West Side Story (1961) (with ten), and Ben-Hur (1959) (with eleven). With its Best Picture win for the expensively-made film, producer Saul Zaentz became a multiple Oscar-winning producer over a span of twenty years with over twenty Oscars for his films: One Flew Over The Cuckoo's Nest (1975) (5), Amadeus (1984) (8), and The English Patient (9). With his win, Zaentz became a three-time Best Picture producer (his first and second wins were for One Flew Over The Cuckoo's Nest (1975) and Amadeus (1984)). He became the second person to have produced three Best Picture winners since 1951. Only two others were three-time Best Picture producer-winners: Darryl F. Zanuck and Sam Spiegel. 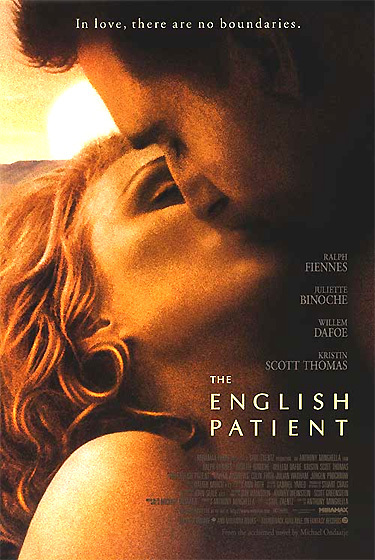 Anthony Minghella won the Best Director award for The English Patient, following the pattern that the Best Director Oscar is often awarded to the Best Picture director. The only one of the five directors of Best Picture nominees who wasn't nominated for Best Director was Cameron Crowe. His replacement in the category was director Milos Forman for The People vs. Larry Flynt (a Phoenix Pictures/Ixtlan Productions film with two nominations and no wins) about the infamous, unrepentant pornographer and Hustler Magazine publisher. Three out of the four winners in the acting categories were first-time nominees. Australian actor Geoffrey Rush (with his first nomination) won the Best Actor Oscar for his star-making performance as talented but agonizingly-troubled, mentally-disabled Australian concert pianist David Helfgott who suffers a crippling nervous breakdown when pushed to the breaking point in Shine. In a surprise win, Cuba Gooding, Jr. (with his first nomination) won the Best Supporting Actor Oscar for his performance as Cruise's faithful client with a memorable line of dialogue ("Show me the money") - a black football player for the Arizona Cardinals named Rod Tidwell in Jerry Maguire. In another surprise win, Juliette Binoche (with her first nomination) won the Best Supporting Actress Oscar - she was the only nominated actor or actress in The English Patient to win the Oscar - for her performance as Hana, the fragile, good-hearted, and sympathetic Canadian nurse who cares for the dying, burn victim WWII patient (Ralph Fiennes). The Best Documentary this year was When We Were Kings, a chronicling of the 1974 world heavyweight championship bout ("Rumble in the Jungle") in Zaire between Muhammad Ali and George Forman. Kenneth Branagh's Hamlet (with four unsuccessful nominations, Best Adapted Screenplay, Best Art Direction, Best Costume Design, and Best Dramatic Score) was lacking nominations for Best Director, and performance nominations for Kenneth Branagh as Hamlet, Julie Christie as Gertrude, Kate Winslet as Ophelia, and Derek Jacobi as Claudius. John Sayles' Lone Star (with a great performance by Kris Kristofferson as a Satanic border-town sheriff) was recognized with only one nomination, Best Original Screenplay (losing to Fargo), and Doug Liman's Swingers went nomination-less. Courtney Love's supporting role as Althea Leasure Flynt was bypassed in the recognition given to The People Vs. Larry Flynt. William Macy might have fared better if nominated for Best Actor instead of for a supporting role, when compared to co-star Frances McDormand, who won for a leading role. Danny Boyle's UK film Trainspotting about a heroin addict was able to garner only a single nomination for Best Adapted Screenplay (losing to Sling Blade), and Mel Gibson was unnominated for his performance as ex-fighter pilot Tom Mullen in search of his kidnapped son in Ron Howard's crime thriller Ransom. Joe Pantoliano was neglected for his role as Jennifer Tilly's psychotic mobster consort Caesar in the lesbian noir Bound. Kate Winslet was un-nominated for her role as ostracized Sue Bridehead for expressing her forbidden love for her cousin Jude in Thomas Hardy's adaptation, Jude. Noah Taylor was under-rated for his performance as teenaged, emotionally-damaged pianist David Helfgott (also played as an adult by Oscar-winning Geoffrey Rush) in the biopic Shine. Tony Shalhoub was unrecognized for his role as mid-50s Italian chef and restaurant co-owner Primo in Big Night, and Harry Belafonte was un-nominated for his supporting role as Depression-era black mobster Seldom Seen, memorable in a scene in which he disagreed with Marcus Garvey's 'Back-to-Africa' movement, in Robert Altman's Kansas City (with no nominations). And Meg Ryan was bypassed for her role as tough Gulf War Captain Karen Walden in Courage Under Fire, as was Catherine Keener for her role as a neurotic 30-yr. old single New Yorker struggling with loneliness in Walking and Talking.